It was the second era, and basically the time in which Taylor was cementing herself from a one-album artist into an international phenomenon. The Speak Now album itself was also a transition, where every song was made by Taylor herself and hidden gems that didn’t made it into the mainstream media became fan favorites that only a few people would know. It remains Taylor’s most ambitious tour as well, taking her to countries she had never been before in Asia and Europe. We also get a new member and musical director: the immensely talented David Cook. This was also the first tour that I covered from start to finish, writing entries for every city and came up with the label of Inside Speak Now whenever I was giving out spoilers for people who had not seen the tour yet. I wrote two personal concert experiences plus a rare treat: Meeting the Agency! This tour also brought us the Arm Lyrics, surprise song covers usually relevant to the location where she was performing and duets with secret guests. During the Montreal concert, Taylor grabbed my hand as she walked through the crowd. 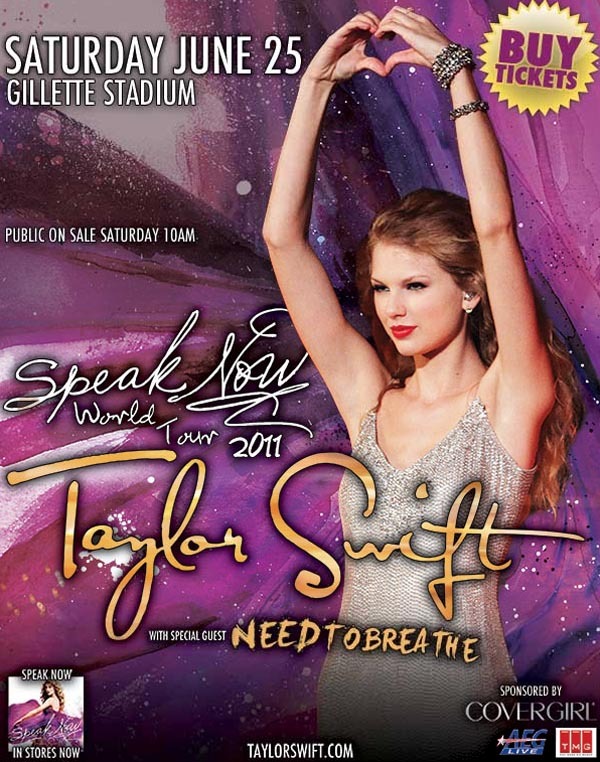 Long Live the Speak Now Tour!